Pigepiphany -- noun -- 1. Tasting real pork for the first time. 2. 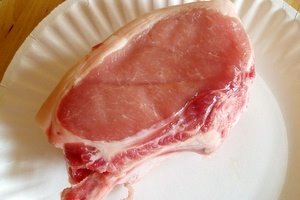 A realization that 99% of pork sold in the US is complete crap. 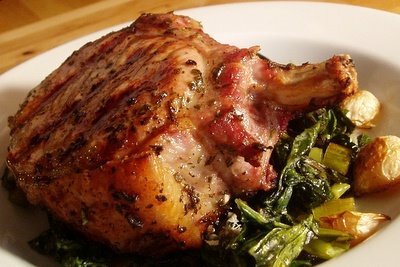 American pork is bred for leanness to meet consumers’ unquenchable thirst for all meats to look and taste like chicken. Nothing against chicken, but people’s obsession with it is absurd. If American food industry could breed chicken in fish, pork, beef, and lamb flavors, they would. Since food science hasn’t reached such heights yet, we settle for “chicken of the sea” tuna and the “other white meat” pork. “What you need is Berkshire or Kurobuta pork,” the chowhounds told me. Big foreign words to describe something as simple as a pork chop make me nervous. But curiosity got the best of me and I Googled for Savenor’s phone number. Surely, a butcher where Julia Child used to shop had to carry it. “It is fatty?” I asked. Ok guys. The words “beautifully lean” would be a compliment for a model, not for a pig. Try number two -- John Dewar’s. By now I felt like a desperate drug addict calling a dealer. For comparison, I decided to get their regular pork chop for $6/Lb. “Are they from different places?” I asked. I don’t know why I always ask them for advice. I guess I need that extra reassurance with meat. They’ve told me stuff before that backfired, and different butchers at Dewar’s have given me conflicting advice. I agree with the Dewar’s guy on brining. It’s really a cheap and dirty trick to enhance otherwise mediocre meats. I love how consumers are all up in arms about “enhanced pork,” so they buy Whole Foods’ untreated pork only to bring it home and brine it. How do you think pork gets “enhanced”? Marinade is a whole other thing though – it doesn’t make the pork spongy and can impart flavors other than just salt and sugar. Not to mask the flavor of the meat, I settled on a simple marinade of rosemary, garlic, lemon juice, olive oil, salt and pepper. 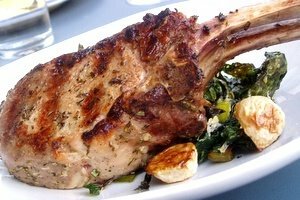 After a couple of hours, I fired up the grill, dried off my chops, and grilled them – first on the bone side to melt the fat and crisp it, and then on the flat sides. As soon as they browned, I turned down the heat to low until the chops reached 125F in the center. It’s not as undercooked as you’d think since the temperature went up another 10-15 degrees while they were resting. The only thing I did differently this time was keep the grill uncovered. This allowed the chops to brown nicely, while keeping the ambient temperature of the grill lower. The higher the temperature, the more the meat toughens, but the lower the temperature, the less the meat browns and less flavor develops. Man, and people say cooking fish is hard! After a 5-7 minute rest for the chops, during which they posed for pictures, we finally got to take our first ever bite of Kurobuta pork. Oh my! This is the part where words escape me. You didn’t need a knife. You didn’t even need a fork. The only reason you needed teeth was to get the pieces into your mouth. From then on, they just melted away. If this was a wine, I’d say it had a nice long finish of a Burgundy Grand Cru, but instead of truffles and violets, it tasted like a platonic ideal of a pig -- more flavorful than ribs, more tender than a tenderloin, more tasty than any pork I’ve ever had. Eating a regular pork chop after this revelation was like drinking Two Buck Chuck. Ok, maybe not that bad. Whole Foods chops are like Two Buck Chuck. Dewar’s are like a $10 Australian Shiraz -- slightly better than the supermarket chops, but still of the “other white meat” garden variety. We took a few bites for the sake of science and left it at that. I must confess that the reason I undertook this experiment was to prove to myself once and for all that pork chops are not worth cooking and that paying $20 for pork is complete insanity. In that respect I failed miserably. 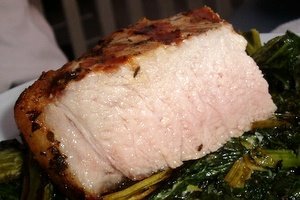 That pork chop was worth a bowl of bluefin tuna; it was worth a slice of foie gras terrine; it was even worth an hour in the gym. Lena, could you post something involving ground lamb (or something ground, since it’s so readily available in the supermarkets)? 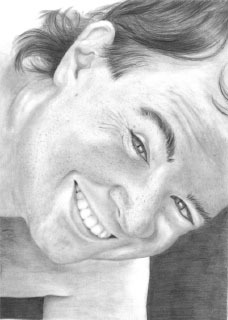 Thanks again for your terrific blog! I love Indian cuisine, but have never tried to cook it at home, so not much help there. As far as ground beef or lamb goes -- I love a great burger and have been obsessing with getting the seasoning and doneness just right for the past 2 years. I obsess about food a lot, as you can tell :) The recipe that finally led me to success was Michael Schlow's. I make my own fixings, but his timing and grilling technique is dead on. The only thing I can add is only put a little bit of salt and pepper into the meat when mixing and shaping and put a lot of salt and pepper on the outside of the burgers right before grilling. Be very generous with salt (about 1 tsp kosher salt per pound of beef). His recipe calls for 80/20 beef. If you can't find it, 85/15 is fine too. Wow! So impressive! Looks so moist and tender. Welcome to the world of real pork! It's nice here. Now, can I interest you in some grass-fed ground beef? I really enjoy your blog! I've been reading for a while now but once you mentioned pork, this Iowa-raised girl just had to add that Iowa pork is superb and one of the few places to get a lovely 2 inch thick chop! =) Now that I live in Paris, I definitely appreciate the fact that 'fat' isn't a dirty word like it is in the States and most of the meat is pretty flavorful. I enjoyed this post, thanks! So as one Bostoner to another (okay, so you're a Greater Bostoner), where exactly is Dewar's? Thanks! Dewar's has 2 retail locations. There is also a Boston location for whole sale. This one is probably the closer one to you. Call them and ask if you can buy smaller quantities from there. You've opened my eyes (and my mouth). I want some of that pork chop! There really are great meats avail. in the States. Go to a good butcher at your local market or even the local Chinese grocery and you'll find better than the run of the mill meat. You rule - your posts are so thorough, entertaining and informative....just great. Check this one out, a comparison between standard issue supermarket beef steak and a dry-aged version. I recently tried, for the first time, a dry aged sirloin purchased at Whole Foods. The price was ridiculous, something around $20.00 / lb., but for a once in a while treat...you wouldn't believe it. Like night and day, similar to your pork experience. I rationalized the price also by noting that the meat is much richer, so two people can split one decent size steak. Grill one of these over a big pile of red-hot charcoal - with PLENTY of our beloved salt - and let the good times roll. I look forward to your posts all week - keep it up! You are so sweet :) I am blushing! The posts do take work, but when I see your feedback and all the lively discussions these topics spark, it makes my day. For those of us who have to make do without a grill, could you suggest an alternate method of cooking? I have a gas broiler but the flame is pretty weak. Thanks for the Dewar's locations too! So I went to Dewars and bought two chops and had them deboned. The first thing I noticed (after the marbling) was the piggy/meaty smell. I marinated the chops in rosemary, olive oil, lemon juice and chopped garlic scapes. I cooked in them in my cast iron skillet for two minutes per side on high heat then turned it down to medium and cooked them another four minutes per side. They were nice and browned, and got up to about 135 degrees. I used a little vermouth to deglaze the pan and just poured that over the chops. They were great! Now there's no going back. I don't know how hard it would be, where you are, but when my husband and I moved to an extremely rural part of Virginia, we discovered the wonder of being able to buy locally raised beef and pork from our neighbors; not large-scale commercial producers but small, family-owned farms, most of whom favor organic methods, healthy livestock feed, and humane treatment for their animals. Our first experience with organic, grass fed beef was enough to make believers out of us. My first pork raised out here (by a family who's become like an extension of our own since we met) made me nearly unable to bring myself to buy meat in a market anymore -- even Whole Foods. Thank you so much for advice. We are urban dwellers (in Boston), but I am hoping to find a vendor of locally raise beef and pork in a farmer's market. Great article and pictures. Joan pointed it out to me. I had just done a post about pastured pork on my Sugar Mountain Farm blog. It is a call to compare. Hi, I actually got here by way of the link from the Sugar Mountain Farm blog. What a great, well-thought-out and executed post! I'm going to start reading through your bog! Have a great day, and keep up the good work! I might recommend trying wild boar. I've found that it can have very nice flavor. Can't compare it to the type of pork you bought since I haven't had the pleasure of trying that. I'm not sure if wild boar country extends as far North as Boston, but it is readily available in the South East. I recently had a Wild Boar here in CA, that had some sort of a juniper berry, deglaze, reduction... oh, my goodness, how delicious. And that was after a wild mushroom and scallop gratin appetizer. I'm a new reader of your blog... love it! Thanks so much for the wild boar tip. 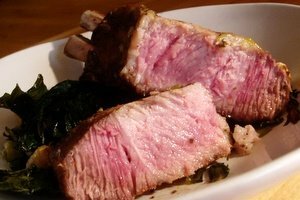 Would you happen to know if dry cooking methods like grilling and roasting work for it or is it on the tough side and has to be braised? It probably varies... they haven't had selective breeding for one aspect or the other so you probably get wild boar in different shapes, sizes and degrees of leanness. It probably would help to find a source where the butcher could give advice suitable for the meat on hand. I would sort of consider that as one of the beauties of using wild game... it adds an extra layer of gleefulness when one matches the right technique with a particular cut to create a bit of culinary magic. A local island community recently had a program to eradicate all their wild boar because they are non-indigenous and were causing other environmental damage. Someone suggested using all the meat for communal BBQ and boar roasts down by the beach. Crazy as it may sound, animal rights people created a fuss and said it was wrong to have the BBQs. So the boar got killed anyway and the meat not used. Such a shame. Growing up in FL, I've had some tasty wild boar BBQ ribs. Wow thanks for the education. Inspiring and informative. I too have recently been turned on to the superior meat quality and taste of heritage hogs. Its amazing how there is such little promotion of heritage hogs within the USA; so much so, that we have lost many breeds since 1930 due to low consumer demand. I truly appreciated your story, and thank you for raising awareness of your subscribers. 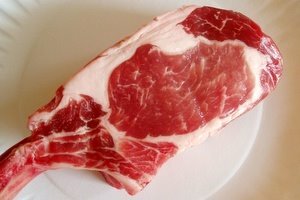 For those interested in breed information and/or finding a local supplier of Berkshire hogs, I recommend the American Berkshire Association. On their website they have contact information for farmers who agree to raise their hogs in a very specific manner to ensure the highest quality of meat. Some of you may be surprised to find one of these farmers living in your own back yard. Last year we purchased a 300 lb Berk for $0.60/ lb (on the hoof) and ended up with 165 lbs of packaged meat for the outrageous price of $1.23/ lb. Luckily, we are fortunate enough to be able to do the processing ourselves which keeps the cost down, but most meat markets will slaughter, process, and package a hog for about an additional $0.30 to $0.50/ lb. If you have the freezer space, this is the only way to go.